Do you remember hair combs? Yep, I’m talking about the old school ones your mom used to use in your hair. These little ingenious creations have made a comeback with a vengeance! They come in all different sizes and colors, and there are even some cool designs to help give you new and creative ways to style your hair. You might have some already in your drawers, so go grab them. If you don’t, it’s time to take a trip to your local beauty supply store. Let’s see how we can transition your day look into a fabulous nighttime style. A great evening look is chic and stylish, and you can be a little bolder with your hair. One of my favorite looks, and a popular one among curly girls, is a faux hawk. Hair combs are the perfect tool to create this style because they’re strong enough to hold all those curls back without causing damage. Because of the simplicity, this style is great for any length, short or long. In fact, I think this style looks exceptionally fly with shorter hair…it just makes the curls stand out even more! There are so many variations of the faux hawk style, but I usually like to keep it simple; again, you can be as bold as you want! Part the Front: Since my hair is longer, I start by picking a side that I want my hair to fall to. You may or may not want to make a hard part here. You can take the front section of your hair and part it on the side you usually do or just sweep it to the side you want it on. Pin the Sides: Once you have decided on that, smooth the hair on one side up towards the crown of your head. Then, take a large hair comb and put it in your hair (with the teeth going down towards your ear) to hold it in place. Flip your hair over and do the same thing to the other side. Pin the Back: Smooth back of your hair up towards the crown of your head. 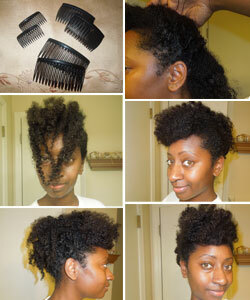 Then, take a medium-sized comb place it to hold up the hair in the back pushing it down towards your neck. Style the Front: Now for the front of your hair, you can do one of two things: leave it out, or pin it up. I usually choose to pin my hair up because it’s so long and I don’t want it in my face when I’m partying. To pin it up, gently sweep the hair to one side, take a small hair comb, and pin it in place. I love bangs, and this gives me just enough to make me happy! Here’s a quick tip to make your life easier when using hair combs. You should go in the OPPOSITE direction than you would think. When I first started using them I didn’t know I was using them wrong, but my hair never stayed up! Putting it in the opposite direction allows the teeth of the comb to really grasp and hold your hair in place. So don’t go in the direction you are pushing your hair in, put it in the other way and your hair will stay for the night! Happy styling! What variations do you love to do on a faux hawk?